Strangely enough I long to write, but do not know what or to whom. This inexorable passion has such a hold upon me that pen, ink, and paper, and work prolonged far into the night, are more to my liking than repose and sleep. In short, I find myself always in a sad and languishing state when I am not writing, and, anomalous though it seems, I labour when I rest, and find my rest in labour. 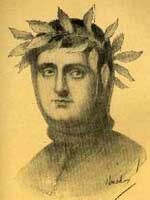 Petrarch made a collection of the letters he wrote. Divided into 24 books, there are a total of 350 letters. However, due to copyrights of the English translations they can not all be included. Below is a list of all the books and the letters within the collection as titled by Aldo S. Bernardo with some minor changes to those titles. A few translations do exist in the public domain and are available here. To his Lelius, on the notable efforts of eloquence and of music and the fact that the most savage beasts are soothed by flattery and sweetness.